There are lots of challenges to overcome when moving house, with some materials requiring extra consideration. The packing and transportation of alcohol can be difficult due to safety and legal restrictions, with alcohol classified as a flammable material in some jurisdictions. The fragile nature of alcohol bottles and expense involved with certain beverages also throws up challenges. Before moving alcohol, it’s important to formulate a plan and have the right packing materials on hand to protect your belongings. Working with a professional and caring moving company is the best way to ensure the safety of your valuable belongings. While a moving company will always try to meet your needs, certain items can’t be transported due to safety and legal restrictions. Before moving day comes around, it’s important to ask your chosen removalists if they can transport wine, spirits, and other alcoholic beverages. The situation can differ from place to place and company to company, so it’s important to ask questions before you’re put in a tough situation. If your movers are unable to pack and transport liquor, it’s important that you avoid hiding packed alcohol bottles in your boxes. Not only is this dangerous, it may also be a direct violation of their policies. Even when alcohol transportation is allowed, it may be necessary to inform your moving company and label all boxes accordingly. Small and independent removal companies are often able to provide a more personal level of service when it comes to moving alcohol and other sensitive items. While people often think that movers are unable to transport liquor, smaller moving companies are often more than happy to provide safe and reliable storage and transportation for alcohol bottles. If you’re unsure of where your moving company stands on this issue, simply give them a call or write them an email. Alcohol can be expensive, with wine and spirit collections often costing thousands of dollars. Fragile and valuable items such as these require extra attention when it comes to packing. 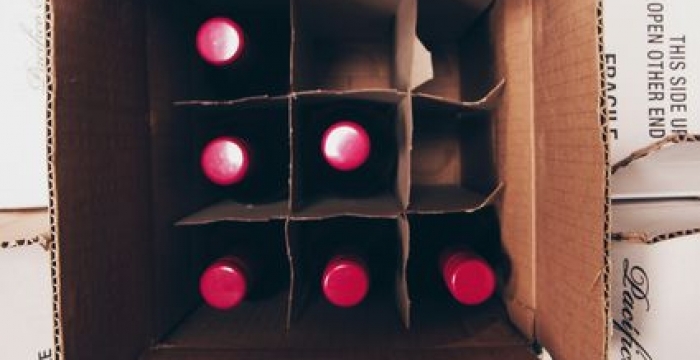 Wine and spirit bottles should always be packed in specialty boxes and crates to avoid damage and spilling. Whether your removalists are able to transport alcohol themselves or not, it may be possible to obtain cell boxes with installed cardboard protection directly from them. Styrofoam dividers can also be a useful packing material for alcohol and other glass bottles, with this protective material stopping bottles from banging into each other while in transit. The safe packing and transport of alcohol rely on both cushioning and space, with each bottle needing to be protected from damage while isolated from the bottles around it. It’s important to avoid overloading your boxes and placing bottles too close together. Not only is this more likely to cause damage, moving heavy boxes can also be dangerous. Dedicated wine storage boxes are available in Australia, with 6 and 12-bottle boxes available from moving companies and wine retailers. While these storage boxes can be more expensive than regular packing boxes, they will ensure that your bottles arrive without breaking. Depending on the box you use, it may make sense to reinforce it with packing tape and extra cardboard prior to transport. Extra consideration needs to be taken if you’re packing opened bottles, which should remain upright at all times and be carefully sealed. If you’re dealing with a particularly expensive collection of wine or aged spirits, it’s also important to think about temperature during transportation. While short-term exposure to heat and vehicle movement is unlikely to affect the quality of liquor, covered and shady transport is always preferred. It’s especially important to think about temperature if you plan on storing your collection prior to transport, with temperature and humidity controlled conditions always recommended. Standard storage sheds and containers are often ideal for the long-term storage of wine and other liquor, with the shaded concrete and steel conditions keeping them safe from water damage and unwanted humidity. Professional moving trucks are also ideal, especially if the products are well labelled and known to the moving company. If you have any questions regarding the safe storage, packing, or transport of alcohol, call your moving company today and find out their policy.